Do you know the difference between antique, vintage and estate jewelry? When it comes to jewelry, the terms for antique, vintage and estate jewelry have meanings that are similar. However, the value of each jewelry piece is greatly influenced by the differences between the three. Before you purchase previously owned jewelry in Pinecrest, you should read this article so you are able to differentiate between the three. The terms estate, vintage and antique jewelry are utilized for helping date older fine jewelry pieces. What makes jewelry pieces antique? In the Pinecrest jewelry industry, this is a usual question and there are varied answers. Technically, not all jewelry that is brand new is considered estate jewelry but not all estate pieces are considered vintage. Let’s break it down further so that it is easier to understand. Any jewelry piece that is a hundred years old or more would be considered antique jewelry. Most pieces from the twenties are not considered antiques, particularly those made in the decade’s earlier parts. When a reliable dealer refers to jewelry pieces as antiques, you can be sure that this is very old heirloom. On the other hand, when you hear the term ‘antique style’ this indicates a reproduction. As a matter of fact, any time you hear any jewelry description referred to as a ‘style,’ and the pieces seem old but there is no reference to its age, these would most likely be pieces that have been reproduced. For fine jewelry pieces to be considered vintage, these have to be between twenty and thirty years old. Thus, vintage pieces are anything from the eighties. Most likely, the most common jewelry term you will hear is vintage. The reason for this is that it encompasses larger collection of jewelry age. Would an 1800 ring be considered vintage? Yes, technically speaking. Of course, rather than classifying the ring as vintage, many jewelers would want to highlight the age of the ring and call it an antique. The engagement ring your grandmother had from the forties, for example, would be a vintage ring of engagement. Any second hand jewelry piece is called estate jewelry. For instance, if you got engaged a few years ago and unfortunately, the wedding was called off and you decided to sell your ring, the jeweler who purchases the item will resell the item as an estate-piece. Generally, dealers limit this term to pieces made in the last thirty years so as not to describe every single jewelry piece as estate. Thus, when you hear the word ‘estate,’ these pieces are not very old, usually. Are you searching for antique, vintage or estate jewelry in Pinecrest? Whether you are a buyer or a seller of jewelry in these categories, knowing where to go will make a difference in terms of getting the right appraisal. As a matter of fact, when you are dealing with the purchase or the re-sale of pieces of such significance, taking time to know which Pinecrest jewelers are the most reliable will go a long way in terms of a satisfying customer experience. A suburban Florida village, Pinecrest went through a project of beautification in 1996 that included the planting of a thousand trees and the addition of many new parks. Throughout the village, there are unique street-signs and repaved roads. The crown jewel of the park system of the village of Pinecrest is Pinecrest Gardens. There are various programs offered by the park including kids’ camps in the summertime. The park’s location is on the Parrot Jungle’s former site. While in Pinecrest, you might be interested in buying or selling your pieces of antique, vintage or estate jewelry. 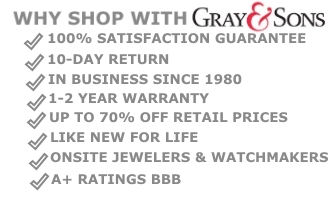 To get a good appraisal, check out Gray and Sons. This way, you can be sure that only the most accurate, reliable value will be given to you. With three decades of expertise behind them, Gray and Sons is the place to go. After getting an appraisal from gemologists that have been accredited and certified will save you the trouble of having to get a second opinion anywhere else. To find the most exquisite estate, vintage or antique jewelry in Pinecrest, a reliable source like Gray and Sons will give you expert advice and appraisals when you pay a visit. After all, a company that has been in the jewelry business for over 30 years knows the value of a returning customer. In Pinecrest, there are a few things to consider when selling or buying jewelry pieces. Whether you are in the market for antique, estate or vintage jewelry and whether these are pieces such as rings, bracelets, brooches, tiaras, necklaces or lockets, Gray and Sons will not disappoint. After all, having been in business for these past three decades means this company knows what it is doing. 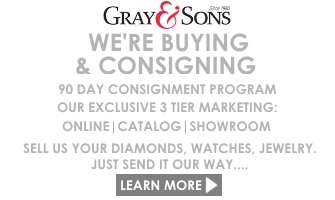 Sell Your Estate, Vintage or Antique Jewelry Pieces to Gray and Sons Pinecrest! Gray and Sons sells as well as purchases estate, vintage or antique jewelry pieces including necklaces, loose diamonds and gold items. This also includes pieces that have gemstones as well as watches. No matter what you are looking for, you will be sure to find it at Gray and Sons or on their website www.grayandsons.com. Also, if you are selling your own personal jewelry, there is an in-house staff trained to make the perfect appraisal for your pieces.